Tough Cookie takes in the views from near the summit of Mt. Chocorua. 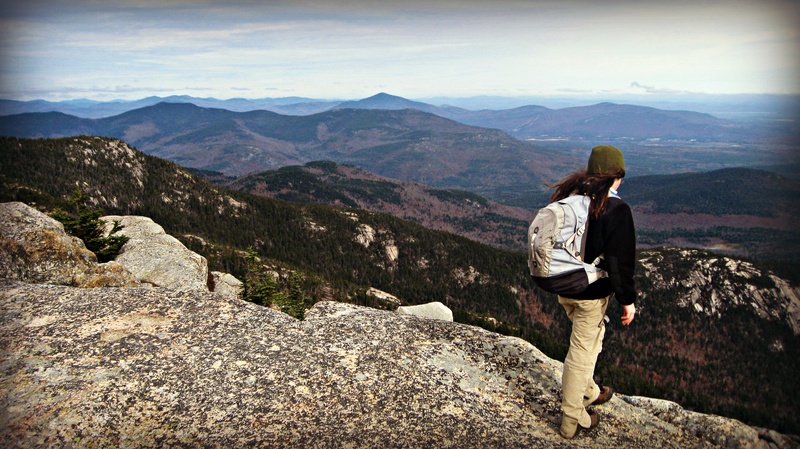 Author’s note: Today, as New Hampshire rests and we all breath a sigh of relief that Sandy seems to have passed through the state without too much hardship, I thought I’d offer our readers an extended excerpt from our recent hike up Middle Sister and Chocorua. This hike was a watershed moment for us, where all our effort and training these past few months played out. Janelle and I agree that Chocorua was our favorite mountain on our journey thus far. Thoughts go out to our friends in the mid-Atlantic. Stay safe and dry everyone! Onward! Janelle blows by two hikers like they are standing still. 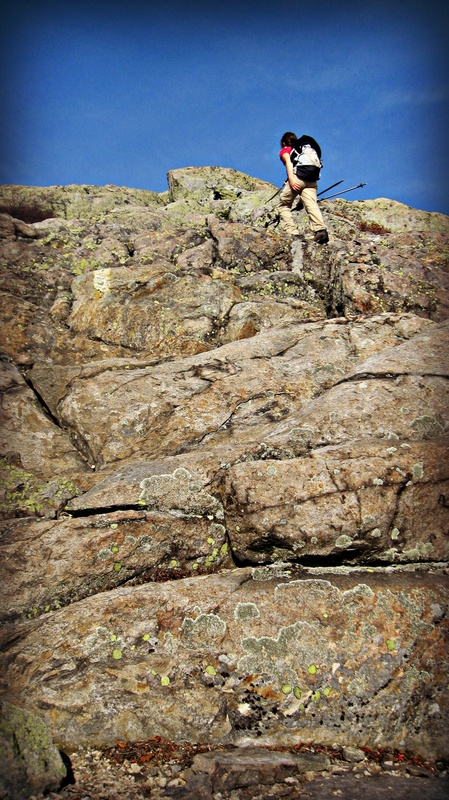 The enormous summit block of Chocorua rises before us like a granite castle, hard rock seemingly shooting straight up like grey seracs. A stiff wind rolls up out of the valley, gaining velocity as it creeps up the side of the mountain. Atop one ledge, the wind hits us and I watch her hobble for a split second before planting a pole, ducking her head and regaining her balance. She’s learning how to do this, how to readjust to changing, and challenging, conditions. She loves rock. She asks on every hike if there is any scrambling. Now, Janelle has a full quarter-mile of nearly nothing but rock – exposed and sheer – to play on. I work hard to keep pace. In some areas the trail takes us up and over ledges that are eye level on her. But we work together. The wind is too loud to hear each other, but after 44 mountains we know each other well enough to not need to talk. She’ll toss me her poles, use her hands, then I’ll toss them up to her. In one instance, she waits before climbing up a ledge and I realize she wants me to plant myself below, in case she slips. It is a solid 30 minutes of trail dance as the girl and I duck and dodge and shimmy up this mountain, on top of the world, at the top of our game. Two months ago, she could not have done this. I would not have let her try. But now, we’ve reached that moment that hikers always long to feel, where the hike is effortless, where you are so in the moment with the trail that there are no aches or pains, no worries. Only joy. We spin like this around the base of the summit rock, and she skitters ahead of me toward the summit. There, near the top, we encounter reality. 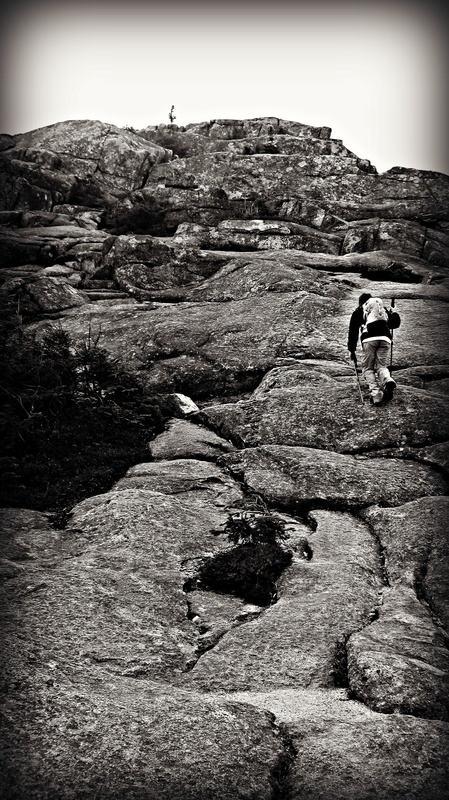 Working the ledges of Chocorua, Tough Cookie gets epic! “You ever been here before? First mountain?” Again, he addresses Janelle. She shakes her head no to both questions. We stop at the glorious summit for a moment, then drop down to a lower rock shelf that breaks the wind. But he’s not done. All I can think is that 100 yards off the summit is no longer the summit. “We like the views,” I say pleasantly. “Great views from down there as well,” he says. “We’re good. Thanks.” I put an edge to my tone which he appears to hear as he doesn’t bother us again. And soon, there are half a dozen other hikers at the summit and we’re forgotten. A hiking friend of mine once suggested that to some adults, after spending hours huffing and puffing their way up a mountain, seeing a child at the top deflates their own sense of accomplishment. Bursts their bubble, so to speak. We’ve been lucky, Janelle and I, surrounded by family and friends and a hiking community that is genuinely enthusiastic and encouraging about our quest. And now, as we sit at the top of Chocorua with the waves of wind from approaching hurricane Sandy bursting like tiny explosions over the mountain’s bald top, the end is in sight. 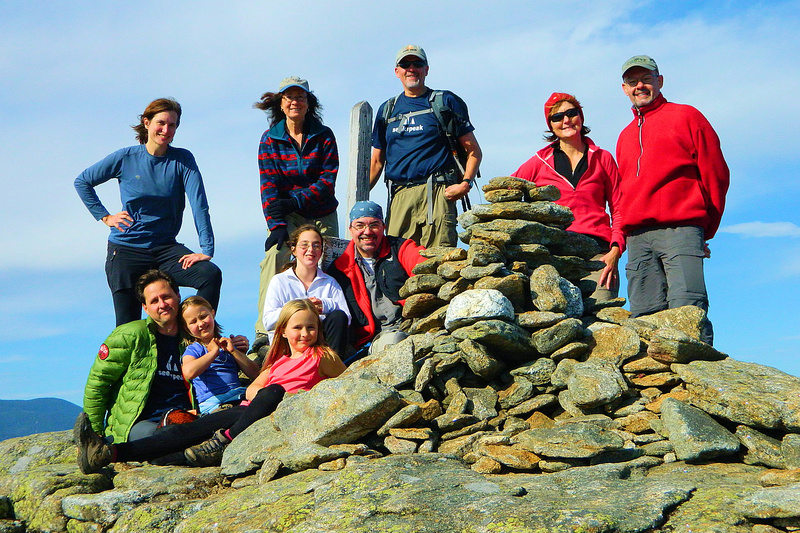 In two weekends, if all goes well, we’ll tag the summit of Starr King together and then… what? For now, though, this is enough. Atop Middle Sister, Tough Cookie does not appear to have been “dragged” anywhere! Location: North Conway, off the Kanc. Route 93 north to Exit 32 Route 112 (The Kanc) to The Champney Falls Trailhead on the south side of the road. Our trailhead: Champney Falls Trail to Middle Sister Cutoff to Middle Sister, then the Middle Sister Trail to Piper Trail to summit. On the return, straight down the Champney Falls Trail. Tough Cookie tackles the big slabs near the summit of North Moat. I stand there, irritated, waiting for Janelle to catch up. Despite the long day and the big miles, I know she can move faster. I need her to move faster, but I’m running out of ideas to motivate. She peers into the trees for a moment. “I have no idea,” she grumbles. Janelle takes a deep breath and I can see the lines of concern. She understands it’s important for us to step it up, but she’s tired. There’s no tears, no early teenage frustration. She’s just tired and lowers her head. I close my eyes for a moment and try to re-focus. She nods and offers a weak smile. “Ok.” We set off into the darkening unknown. Location: North Conway. Route 93 north to Exit 23 to Route 104 east to Route 25 northeast to Route 16 north to West Side Road north (for 0.7 miles) to Passaconaway Road west (for 3.2 miles). We spotted a second car at the other end of the ridge at the Diana’s Baths parking area trailhead. Our trailhead: Moat Mountain Tail, from south to north. Guess our miles and win fabulous prizes! Do you like our bumper sticker design? Let us know what you think. If the response is positive, we’ll make actual stickers available! Well, here comes winter. Or a nor’easter. Or something the weather geeks are calling a Frankenstorm! No matter, Janelle and I are still heading north this weekend in the hope of ticking four more major summits off our list and getting us that much closer to finishing. Despite the impending Storm To End All Storms, the weather looks pretty good for Saturday and not bad for Sunday. If all goes well, by Sunday evening we should only have seven (7) mountains left on the list. Wow, what a ride it’s been. We’re tired, a bit cranky and slightly bleary eyed, but remain determined. The support from all our communities (friends, hikers, family and school) has been outstanding and membership and followers on this site and on Facebook continue to rise. We appreciate that and couldn’t do this without you! Keep it up, it means a lot. We have some exciting announcements regarding our finish date, and our first presentation coming soon. We’ll let you all know just as soon as the dates, times, etc. are nailed down. Until then, please continue to spread the word. Any mention on your own Facebook pages or blogs would mean so much to us. I just wanted to share one interesting bit of trivia with you all. I did a little math yesterday (yes, I CAN do math!) because I was curious how many miles Janelle and I have hiked so far in this quest. Remember, we’ve hiked 41 mountains thus far over the course of 11 months. Let’s make a contest out of it. Whoever guesses the closest to our total miles hiked so far will win a picture of your choice that we’ve published on this site. We’ll even sign it for you! Hint: If you are really ambitious, remember that we’ve documented our actual miles in our excerpts from nearly all our hikes so far! So, make your guess in the comments section and we’ll announce a winner on Monday at noon. We’ll need at least 10 guesses to make a contest out of it. Sound good? Good luck and keep hiking! Tough Cookie wishing she was a thru-hiker at the Smarts Mountain cabin. 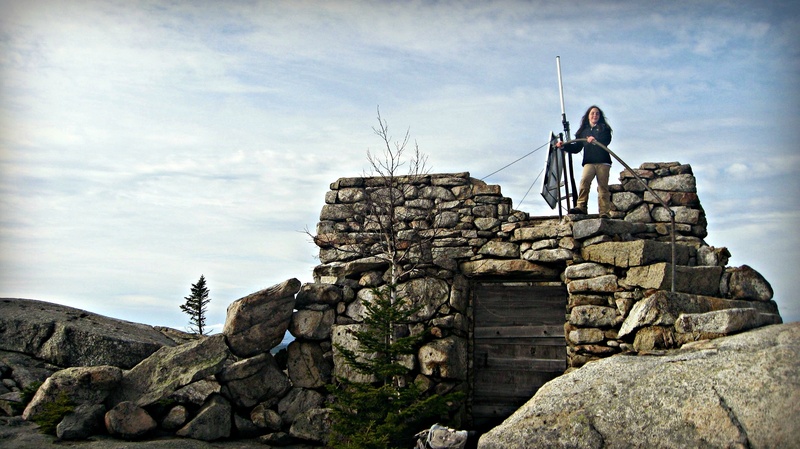 A raw wind whips through the broken windows of Smarts Mountain lookout tower. Janelle and I are 41 feet in the air, huddled in a corner at the top of the tiny tower cab. I can feel the cab shimmy slightly in the wind. If we stick our heads up too high the wind cuts rights though our fleece like a thousand freezing knives. While the views are spectacular from this perch, the tower, built in 1939, is not a particularly pleasant place with its graffiti and busted floor boards. None of that appears to affect the girl in the slightest. This is the first time she’s been able to actually go inside a tower. Kearsarge. Cardigan. Megalloway. The Doublehead and Black cabins. They were all closed when we had been there. 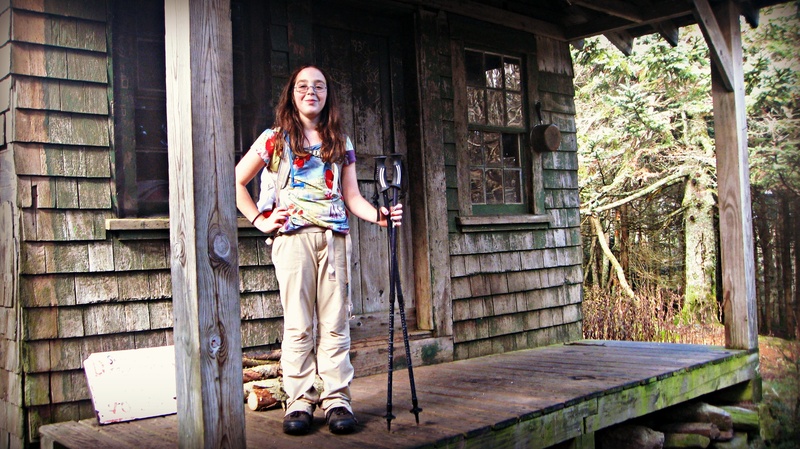 But both the thru hiker cabin and the tower are wide open for us today, and she’s in a good mood. She shucks off her pack and begins to lay out her food and snacks with intense concentration. It’s a picnic then; an outdoor feast at 3,200 feet, in the bitter wind, atop a dilapidated tower with gray clouds and a sleety rain spraying around us. “Are you warm enough?” I ask as she arranges her sandwich, trail mix and apple. “You bet.” I pull the thermos out of my pack, and as I twist it open a thick aroma of orange and ginger tea fills the cab. “Yum,” she says, and smiles, happily oblivious to the torrent howling around us. Location: Near Lyme. I-93 to exit 26 to Route 25 to Route 25a to Quinttown Road to Mousley Brook Road, go right just over the bridge and follow a hairpin turn to a gate. The parking area is on the left. Our trailhead: Daniel Doan Trail up and back. The team atop North Baldface: from left, Trish, Hugh, Sage, Donna, Janelle, Alex, Dan, Mark, Natalie and Michael. Thanks to Michael Serdehely for the photo! Atop Eagle Crag, with the full distance of our hike on display behind us, I take a moment to consider how far we’ve come on this journey. Being contemplative among the good cheer of our new hiking friends is not easy. But that’s a good thing. For too long, Janelle and I have explored our mutual path, mostly alone. We’ve hiked with a friend or two, but this day has been different. There are eight other people with us today, all veterans of the hills, all with stories of their own in pursuit of many other journeys, some complete, some still in progress. I miss Meenakshi and wish she were with us. Janelle draws faces in sparkling mica soil on the ledges with Alex and Sage, her two, newest, best friends. This day has been a positive force in her path, surrounded by a group so rich in enthusiasm and support that I’ve felt comfortable just hanging back at times and letting her truly hike her own hike. There were times I admit when she was not within my sight that my heart would quicken, my thoughts racing. But then I’d remember that she was with someone, the girls were always within sight of someone, and I’d settle back into the meditation of the hike. Later, in the car, in the moments before she drifts off to sleep for the rest of the ride home, Janelle says, “I wish all people were like hiking people.” The notion is sweet and child-like, but she’s right of course. Teamwork, mutual support, encouragement, working for the benefit of a common goal; that’s what you do when you’re at 3,500 feet and have five miles to go and darkness is coming and the ache from the previous miles has slipped into your knees and you’re nearly out of pop-tarts. Location: Evans Notch, south of Gorham, north of Conway. I-93 to exit 37 to Route 3 to Route 115 to Route 2 through Gorham to Route 113 south through Evans Notch to trailhead. 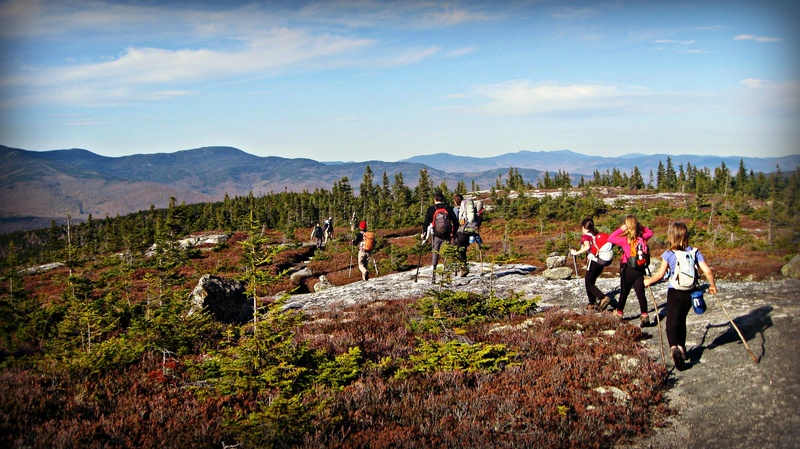 Our trailhead: Baldface Circle Trail to Slippery Brook Trail to Eastman Mountain Trail to Eastman summit. Backtrack down Eastman Mountain Trail to Baldface Knob back to Baldface Circle. Baldface Circle over S. and N. Baldface to Meader Trail then .2 to Eagle Crag. Then, backtrack down the Baldface Circle Trail to complete the loop.